Following up on our publication of Kev Sutherland's take on this year's Bristol Comic Expo, which has generated plenty of comment here, on my Facebook page and in the original Quality Communications forum where the former convention organiser posted his views, we've now published David Baillie's report on the event on the main downthetubes site. "Even if you weren't there, you've probably heard by now that due to the knock on effects of the global credit crunchie this year's Bristol Comics Expo was a slightly reduced affair, he notes. "This might seem a shame, especially given that this was the event's tenth birthday, but I'm here to tell you that smaller is sometimes better." David opines that the success of any mainstream comics event can be judged by how well it performs in seven specific criteria including a good mix of events, social networking and, of course, comics! 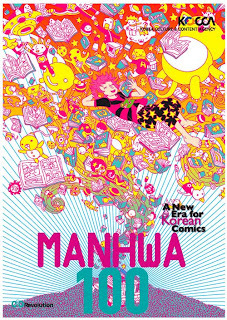 The Korea Creative Content Agency and Korean Cultural Centre UK have announced a celebration of the centenary of Korean comics, known as manhwa, with a host of interrelated special exhibitions, events and film screenings, starting next week. 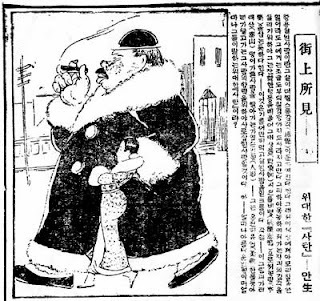 Manhwa: A Language of Unlimited Imaginations, which opens on 21 May, celebrates manwha's 100th anniversary, a popular art form in Korea which began with the first publication of Doyoung Lee's political cartoons in the newspaper Daehanminbo, which was founded on 2nd June 1909. As an art form, manhwa is used to comment on a wide variety of topics. It can often spotlight societal injustices. Sometimes, manhwa tells marvelous tales of dreamy romance. At other times, the art form simply uses its simplified figures and their exaggerated gestures to provide amusement and entertainment. To this day, as with western comics, manhwa continues to evolve and hold a special place within the hearts and minds of Korean society. The history of manhwa highlights unique traits within each distinct era of Korean history, and the exhibition throws light on how authors of each generation interacted with the public. 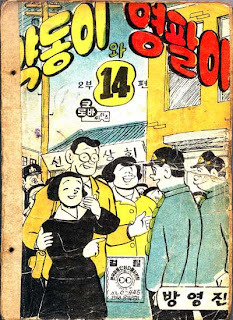 Following its birth, manhwa had to endure Korea's tumultuous history under Japanese colonial rule, then survive the country's national liberation, the dark years of the Korean War, and through the dismal military dictatorship. The 1980's and 90's marked the renaissance of manhwa, while new work from 2000 onwards employs digital media technology offering exhibition visitors the opportunity to interpret present-day Korean comics in a new light and, perhaps, even predict the industry's future. Within the exhibtion are two special displays. Art Toon Art brings together the work of 12 artists, including Dong-Hwa Kim and Young-Ok Kim, whose work pushes the boundaries of conventional comic book art humorously by reinterpreting famous masterpieces. This small display is derived from the exhibition Masterpieces Meet Comics, which is held annually in Korea and is based on the theme of convergence between comics and art. Manhwa Illustrations offers a small collection of work by famous graphic illustrators including Min-Woo Hyung and Kwang-Mook Lim, shown together for the first time. • A number of tie-in events have also been scheduled: see details below. Manhwa artist Chul-Ho Park leads a live drawing workshop with London based journalist and leading authority on Asian comics Paul Gravett. Bang is the Korean word for room. It's a social space where you can hang out with friends and read a wide variety of Korean Manhwa. Two civil workers at the local district office find love but in distinctly different directions. Written by famous Korean comic artist Pool Kang, featuring Ji-Tae Yu (Oldboy) and K-pop singer turned actor Kang (Attack on the Pin-up Boys). Go-Ni loses his entire savings and the money that he stole from his sister in the high stakes card game known as "Hwatu." Go-Ni figures out shortly after the game that he was swindled and he spends the next six months tracking down the person that robbed him of his money. Starring Seung-Woo Cho, Hye-Su Kim, Yun-Shik Baek. The Etherington Brothers are pushing boundaries again, adding another attraction to their StudioBlinkTwice web site which documents their many fab creations - a new online shop selling Blink Twice professional comic board, Malcolm Magic books and more. The launch coincides with the publication of sketch books by fab artist Lorenzo Etherington, ranging in theme from robots, to girls, to monsters, machines and more. Each 100-page collection boasts more than 250 original sketches from the artist behind Monkey Nuts, Moon and Malcolm Magic. The first book, Girls and Monsters, is available now from the Comics Boutique, in two versions: the original volume, and the extra special version including a one-off original sketch from the creator himself. Beyond Blink Twice, the Etheringtons continue to be busy. Rob has just written a story for Transformers Comic, Megatron's Revenge, for Titan (unfortunately attributed to Simon Furman) which is now on sale in all good UK newsagents. • Speaking of the FPI blog, they're also hosting a series of behind-the-scenes essays from up-and-coming cartoonist Oliver East about his new graphic novel from British indie publisher Blank Slate, Proper Go Well High. The book is just the latest in the artist's Trains are...Mint series, all travelogues that document various walks East has taken. • Meanwhile, those readers who want to get a taste of Oliver East's earlier work, could do worse than to hotfoot it to Manchester, where a new exhibition featuring some of his early work. Art School! 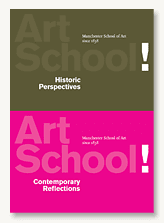 - Historic Perspectives is a vibrant exhibition exploring student artwork from the Manchester School of Art archive at the School itself, spanning the history of the School since 1838. It's the sister exhibition to Art School! - Contemporary Reflections, which was recently held in the Holden Gallery and some of the faculty work exhibited there will shortly be on show in the Special Collections Gallery. The show also features artwork by famous alumni such as Martin Parr, Liam Spencer and Oliver East. 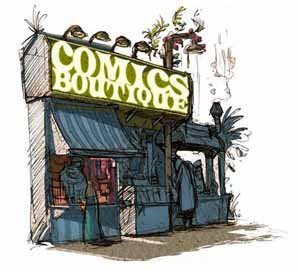 • And talking of events, comics guru Paul Gravett reports two Comica events next month in London. Alan Moore and Kevin O’Neill will be at the ICA in The Mall on 2nd June, discussing the first part of their new League of Extraordinary Gentlemen tale, Century: 1910, in which the League plunge into the brave new 20th century, with Carnacki the ghost-finder, Raffles, Pirate Jenny, Mac the Knife and more. The creators will be exploring their series' vast referential cosmos with popular culture guru Christopher Frayling, rector of the RCA. That event kicks off at 6.45pm and there are more details here on the ICA web site. 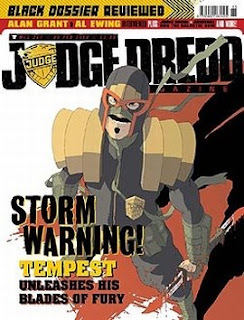 • And finally for this round up... Paul Cornell - comics writer, Doctor Who writer and avid cricket fan - has been promoting some new pages drawn by Adrian Alphona from an upcoming issue of Captain Britain and MI-13 in which the heroes are seen playing the game. Given how Britain has at times been portrayed in US comics (although not, we stress, in this title!) "I'm just hugely flattered that these guys put the effort in to make the game look so spot on," says Paul. You can view the pages here on his blog. Continuing adaptation and inspiration month on the show, Alex Fitch talks to writers Leah Moore and John Reppion for his latest radio show, Strip! : Sherlock Holmes vs. Dracula, on London's Resonance FM. 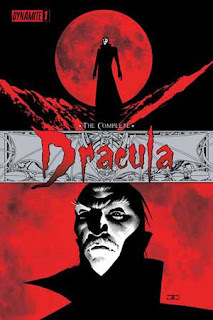 He chats to the pair about their two current comic book projects, adapting Bram Stoker’s Dracula for sequential art and continuing the adventures of Sherlock Holmes in a new comic for Dynamite Entertainment. Coming soon is Strip! : Sherlock Holmes vs. Dr. Jekyll & Mr. Hyde, with Alex talking to the illustrators of some new and recent literary adaptations in comic book format. Self Made Hero is a relatively new publishing company who have made a name for themselves with their range of Manga Shakespeare adaptations and are now doing European style graphic novels of literary classics. Alex talks to Ian Culbard, artist of Ian Edginton's adaptations of The Picture of Dorian Grey and The Hound of the Baskervilles and to Andrzej Klimowski and Danusia Schejbal, illustrators and adaptors of The Master and Margarita and Dr. Jekyll and Mr. Hyde. 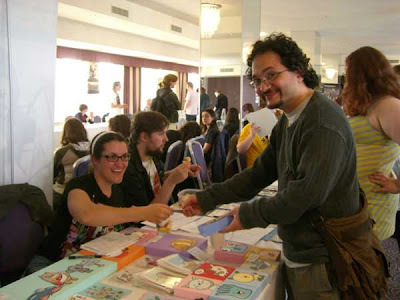 Kev Sutherland, who began the Bristol Comic Festival back in 1999 but is now better known for his comics workshops for schools and other organisations and his work with the Falsetto, kindly agreed to let us run his report on this year’s Comic Expo in Bristol. Firstly, I need to say I didn’t get to the Expo itself on Saturday at the Ramada Hotel – although I did get into the Small Press event at the Mercure. The main Expo itself which was sold out in advance so, according to the website, nobody was going to be able to turn up and get in on the door. I also hadn't been sent an invitation as a guest, which I'd kind of got used to expecting (apart from enjoying 21 years in the business as a professional comic writer and artist, I was also the reason the Comic Expo takes place in Bristol in the first place, having created it as Comics 99 and run or co-run it until 2004). Frankly, I couldn't face the possible indignity of having to face a stranger at the front desk and run the risk of coming out with the phrase "don't you know who I am?" so I gave the daytime event a miss. The impression I got at the bar that evening was that I hadn't missed much. The photos of the exhibitors seemed to be familiar publishers from the previous year, but fewer in number. The most exciting material had always been on the Small Press tables, and those I'd already enjoyed round the corner at the Mercure. But it seems that the down-sizing of the event, losing (through circumstances beyond the organisers' control) the Empire & Commonwealth Museum hall has had a very damaging effect. Without the bulk of traffic that comes with an event open to browsers, and without the Small Press benefiting from proximity to the big boys and vice versa, most people sold less stuff. I wait to be corrected on this, but certainly every person I spoke to who was trying to sell their wares sold less of them that at any previous Bristol show. Other items, like the Charity Art Auction and Awards ceremony, were also missing, but maybe I'm the only one who thought they were needed in the first place. In terms of comic finds I bought (or was given) a few comics, the very best of which was Laura Howell's Tales From The Crust: she's a genius of whose talent I am actually jealous. The Goodman Brothers' Square Eyed Stories 22 and The Banal Pig Landscape Anthology came a close second, the rest were all brilliant – because all comics are in some way or another. Anyway, as always, the Saturday night's drinkathon with fellow comics professionals proved the high point and this year, apart from the aforementioned brief visit to the Small Press event, comprised my entire con. I spoke drunkenly and endlessly with far too many people to recount. Possibly my favourite conversations were with Simon Bisley (possibly the first time we've ever spoken, what a brilliant bloke) and Glenn Fabry (one of those very drunken "you're my best mate" conversations that everybody loves), and I confess I got a little buzz from those people who would insist on mentioning how much better it was in my day (selective memory is a great thing, much of my event-running left a lot to be desired). 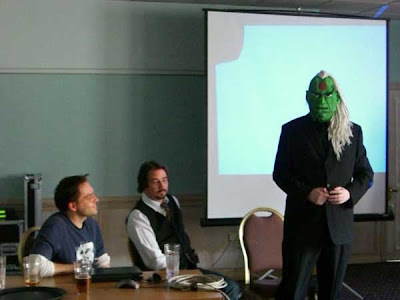 As Britain’s longest-running annual UK comic convention, which has taken place in Bristol since 1999, the fact that this was the event's 10th anniversary, this sadly went uncelebrated. There’s also more bad news: the continuing poor economic climate means next year’s event will not have the benefit of being in the Commonwealth Museum hall, either. I'd imagine would this year's exhibitors who might think twice about paying for a table again if they face the prospect of such low sales, effectively making the Expo more of a mini-con than a Con, I fear. Marvelman Special from Alter Ego, Film Touted? US publisher TwoMorrows Publishing is to release an issue of Alter Ego magazine dedicated to British 1950s hero Marvelman, a character revived by Alan Moore, Garry Leach and others in Warrior magazine in the 1980s. Since then, the character has suffered the ignominy of having to be re-named Miracleman at the insistence of Marvel Comcs and then been consigned to comics limbo, the result of further legal battles. The current question of who owns Marvelman is covered in a very good round-up of recent developments on BobH's Four Realities site here. New developments indicating a company called Emotiv has bought the rights comes from Pádraig Ó Méalóid. Moore himself insists Mick Anglo is the sole owner of Marvelman. "I was happy to do everything that I could to help Mick Anglo, who is the person who has always owned all of the rights to Marvelman, as far as I now understand it, that we never had the rights to do those stories [in Warrior], even though Mick really liked the stories that we did," Moore told Padraig in the interview recently published on Forbidden Planet International's blog. "We didn’t understand at the time that Mick Anglo was the sole owner of the rights. We were misled. So I’ve done everything that I can to clear all that up." The official trailer for award-winning comic creator Bryan Talbot's next graphic novel, Grandville, has just been released. Bryan, probably best known as the author of Britain's first ever graphic novel, The Adventures of Luther Arkwright but also creator of The Tale of One Bad Rat and Alice in Sunderland, has now completed work on this brand new steampunk graphic novel. The story is is set in a retro sci-fi world populated by anthropomorphic animals and stars Detective Inspector LeBrock, who the writer artist describes as a "large working class badger”. "He has the deductive abilities of Sherlock Holmes but, being a badger, he’s also a bruiser and is quite happy to beat the crap out of a suspect to get information," Bryan recently told Steampunk magazine. "His adjunct and close confidant is the diminutive and elegant Roderick Ratzi, who talks like Bertie Wooster and Lord Peter Wimsey. "I wanted to do one of those sorts of adventure stories that starts very small and parochial but gets bigger and more exciting as it goes along until it finishes in an epic climax," he continues. "The story begins with LeBrock investigating a murder in a small English village (in actuality Rupert Bear’s Nutwood). The trail leads him to Grandville, where he discovers a shocking and far-reaching conspiracy. It’s basically fin-de-siecle Paris, populated by animals and furnished with speaking tubes, automatons and steam-driven hansom cabs." 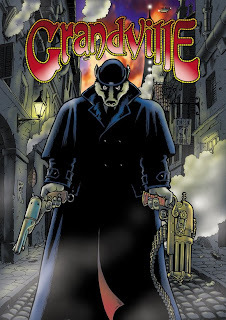 Grandville is set for release in October 2009 and will be published by Dark Horse in the USA and Jonathan Cape worldwide.